In this video we will discuss how to consume an ASP.NET Web Service in an AngularJS application. Let us understand this step by step from creating an ASP.NET web service to consuming it in an Angular application. 1. Create an ASP.NET Web service. 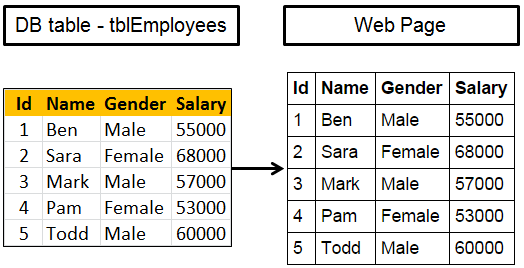 This web service retrieves the data from SQL Server database table, returns it in JSON formt. Step 4 : Add a class file to the project. Name it Employee.cs. Copy and paste the following code. Step 5 : Add a new WebService (ASMX). Name it EmployeeService.asmx. Copy and paste the following code. Step 6 : Add a new folder to the project. Name it Scripts. Download angular.js script file from http://angularjs.org, and past it in Scripts folder. Hi Venkat,May i know? How can we apply validations using angular js.Thank you very much for post angular js tutorials. Thnaks for sharing web service using in Angular js tutorial. Shall you please show a demo of AngularJS Connecting with Database using web API and Rest API (These components are mainly used in real time scenario. Rather than using old asmx). wonder way to explain the Concept i have ever seen. Can you do an insert, update and delete from this example as well? Hello Sir, Thanks for your very useful tutorials. you have any spring mvc based tutorials. How I can send a params please?